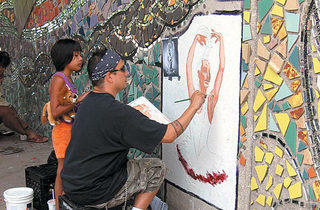 The Chicago Public Art Group brightens the Foster Avenue underpass. Artist Todd Osborne pauses to high-five a giggling girl who brandishes hands coated with cement. 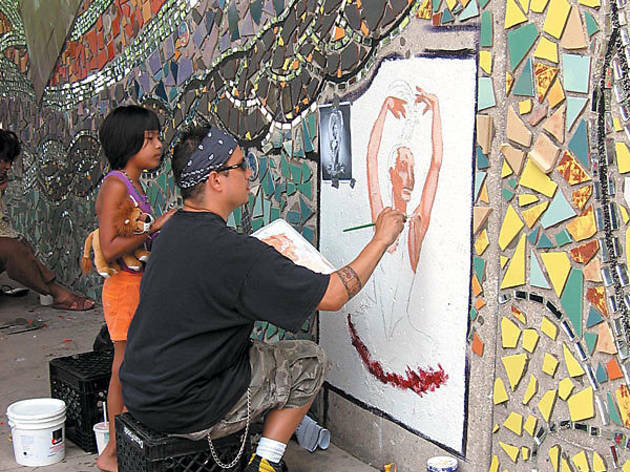 Joined by her dad and older sister, she’s gluing tiles into place on Indian Land Dancing, a Chicago Public Art Group bricolage mural nearing completion on both sides of the Foster Avenue underpass at Lake Shore Drive. On a recent Saturday afternoon, we stopped by the Edgewater site to work on the project with an enthusiastic crowd of CPAG instructors, including Osborne and Tracy Van Duinen; teens hired through Alternatives, a local nonprofit for at-risk youth; and community members of all ages. Osborne asks us to join a team filling in spaces between large, sculpted cattails with purple tiles, and dashes off to consult with his crew. Before we set to work, we chat about the project’s origins with CPAG executive director Jon Pounds, who’s making sure staff members have the materials they need. CPAG began planning Indian Land Dancing last September, soon after it completed its Edgewater-themed Growing mosaic at Lake Shore Drive’s Bryn Mawr Avenue underpass. Ald. Mary Ann Smith of the 48th Ward asked if CPAG’s new mural could honor Chicago’s Native American heritage. Pounds admits he was “initially really cautious” about the project and wondered how it could represent local tribes’ historic “design sensibilities” accurately, given that the largely nomadic people left behind little evidence of their visual culture. So CPAG asked institutions such as the American Indian Center in Uptown—the neighborhood that was once the hub of Chicago’s Native American community—and Evanston’s Mitchell Museum of the American Indian to help assemble a steering committee of artists, scholars, activists and community members who collaborated on the design. Pounds introduces us to Frances L. Hagemann, a past president of the Mitchell Museum’s board and a member of the Ojibwe tribe. She helps us interpret the imagery in Indian Land Dancing, which is named after a poem by the late Chicago writer E. Donald “Ed” Two-Rivers. Both walls contain historic and contemporary portraits of local Native Americans, including photographs; a reproduced lithograph of the Sauk warrior Black Hawk (1767–1838); and Chris Pappan’s painting of Maria Tallchief (b. 1925), who served as artistic director of the Lyric Opera Ballet in the 1970s. Tallchief’s daughter, Chicago poet Elise Paschen, contributed a poem to the bricolage. Calling our attention to the ironworker depicted on the north wall, Hagemann says that, although “many people know about the Mohawk ironworkers” who helped build skyscrapers, few realize there’s a school for Native American ironworkers in Broadview, just outside Chicago. The south wall includes the mythical thunderbird; a turtle, which Hagemann explains is important to the creation story of Midwestern tribes; and Robert Wapahi’s image of a tepee and books, which symbolize local tribes’ transition from oral to written storytelling. These features’ tiling is almost finished, so volunteers cluster around the cattails, which represent Lake Michigan’s shore prior to development. As two volunteers cover the cattails’ sculptural elements with primer, one of our Andersonville neighbors shows us how to paste the tiles, warning us to leave enough room for the grout. Two boys bashing large tiles with hammers supply us with mosaic-size pieces, which we arrange as artistically as possible, wondering if we can transfer these skills to our bathroom renovation. Ald. Smith, who’s shaking hands with volunteers the day of our visit, contributed $107,770 from her infrastructure-related discretionary fund to Indian Land Dancing. She tells us she’s eager to see her ward’s third “gateway to the Great Lakes”—the Lawrence Avenue underpass—get the bricolage treatment soon. Volunteers may work on the mural Monday–Thursday, 11:30am–4:30pm, through August 6.